The Black Swan is a grand, romantic pirate epic. It is played with fun and flair and must be viewed with a sense of humor to be fully enjoyed. The movie is a full-blown extravaganza, complete with sword fighting, lavish costumes, beautiful Carribean settings, and the battle of the sexes. Tyrone is James Waring, most often called Jamie Boy. 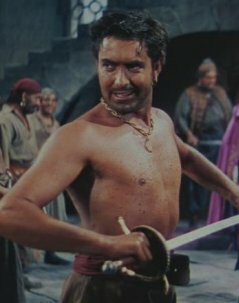 He is a pirate of the high seas, aide to the notorious buccaneer Henry Morgan, played enthusiastically by Laird Cregar. When Morgan is pardoned from the gallows and made the new governor of Jamaica, his chief task is to clean up the seas of pirates. Morgan gathers together his former pirate comrades to see who will join him in the effort. 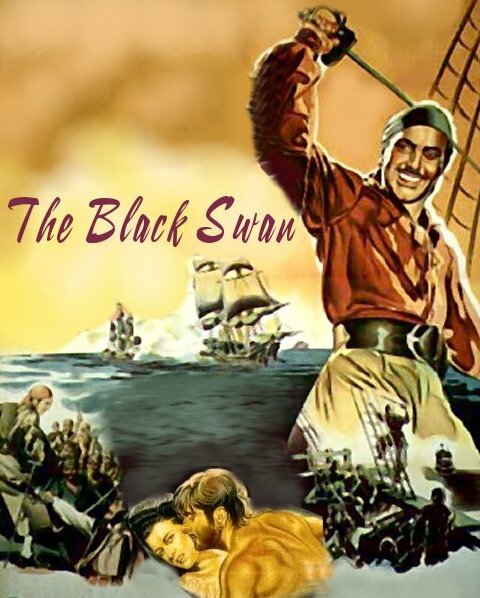 Captain Billy Leech, played menacingly by George Sanders, refuses to join the effort and launches his ship, the Black Swan, back out to sea to seize more treasures off Maracaibo. Morgan does, however, manage to convince the reluctant Jamie Boy to join him, as his assistant, in the governor’s mansion in Jamaica. 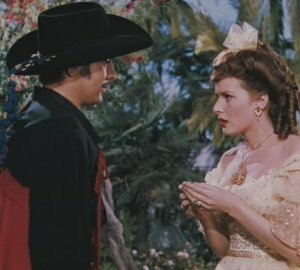 Jamie Boy and his shipmate, Tommy Blue, arrive at the governor’s mansion and choose rooms, with Jamie Boy taking the room of the former governor’s daughter, Margaret, played by the fiery redhead, Maureen O’Hara. Almost immediately, Jamie Boy falls for her. His aggressive and somewhat rough attempts to woo her meet with sound rejection, but he is persistent, and quickly shoves aside her weakling intended, Roger Ingram . His assignment to help rid the seas of pirating is complicated by his pursuit of the governor’s daughter, but he manages to take on both tasks with dash and daring.